Designed to fill the gap between our standard micro-abrasive blasters and large cabinet blast systems, the PowerFlo® and DirectFlo™ are ideal for applications that require more surface coverage and greater media capacity. 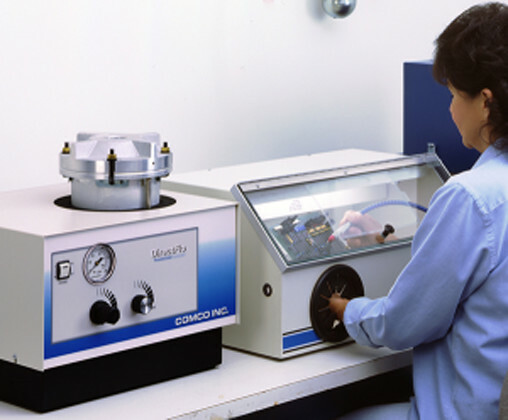 The modulator is the core powder delivery technology in all Comco’s micro-abrasive blasting equipment. The modulator ensures consistent media flow by accurately metering the abrasive in the air stream with a minimum of moving parts. The PowerFlo and DirectFlo are designed specifically for production applications that require more air and abrasive. These robust blasters are able to supply abrasive to larger nozzles and to multiple nozzles. The ample tank reservoir of these systems allows for longer runs between filling. In fact, the DirectFlo and the PowerFlo only require a refill once or twice a shift. Downtime is expensive in any production environment, so we eliminated a common wear item within most blasting units: the pinch valve. Typically a pinch valve withstands no more than 10,000 cycles; however, Comco’s patented PowderGate® valve endures up to 250,000 cycles before requiring any maintenance. The PowerFlo and DirectFlo blasters are available with either a three or a six-liter capacity tank to handle the increased quantities of abrasive required in production applications. Both come equipped with an easily removable tank basket. 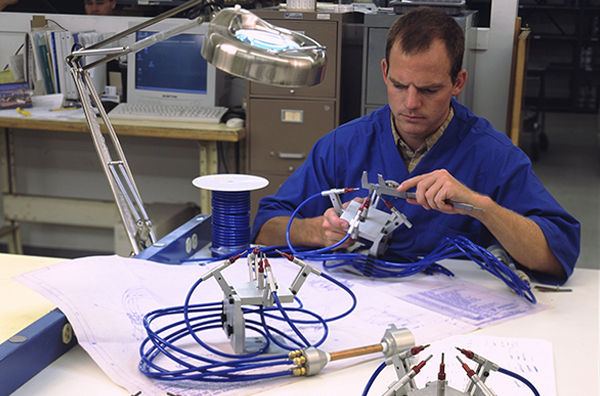 Both blasters use a larger (3/8″) abrasive hose to improve production capability. The bigger abrasive hose allows the use of larger nozzles (up to 0.125″) or use of multiple smaller nozzles for fixtured applications. Increasing your throughput requires more than just adding nozzles and splitting tubes. 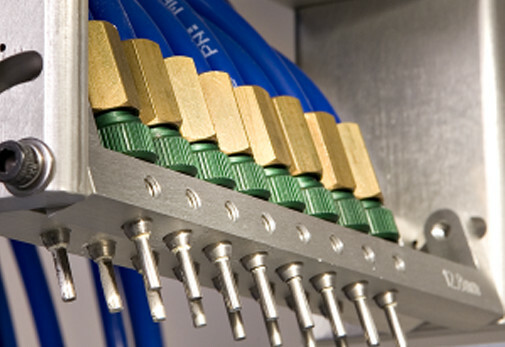 Using larger or more nozzles, increases the airflow requirement. More air leads to higher abrasive particle velocities, which in turn causes more wear to the system. Every aspect is designed to minimize wear in the system. For instance, larger air flow passages increase volume throughput and reduce velocity. Our pneumatic fittings are designed to reduce turbulence. Overall, we minimized bends and directional changes to the abrasive stream. The increased airflow capacity allows for the use of a splitter. 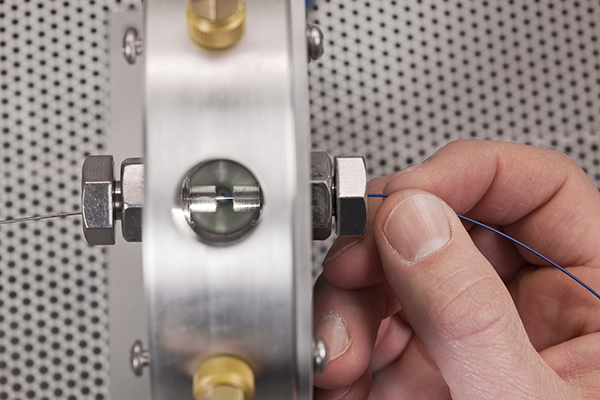 The splitter allows a blaster to process different areas of a part or multiple parts simultaneously. Both blasters are able to feed abrasive to up to five of our smaller MicroBlaster nozzles, depending on blast pressure. 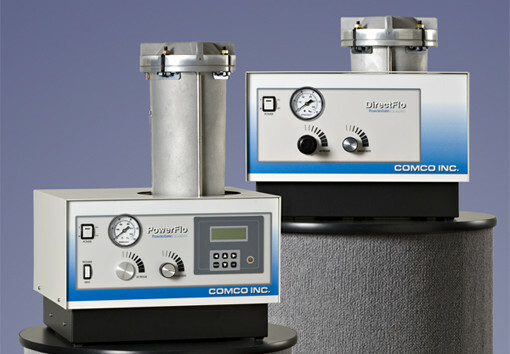 Comco’s Ring Nozzle, powered by a DirectFlo or PowerFlo, is designed to uniformly texture or remove coatings from wire or tubes. 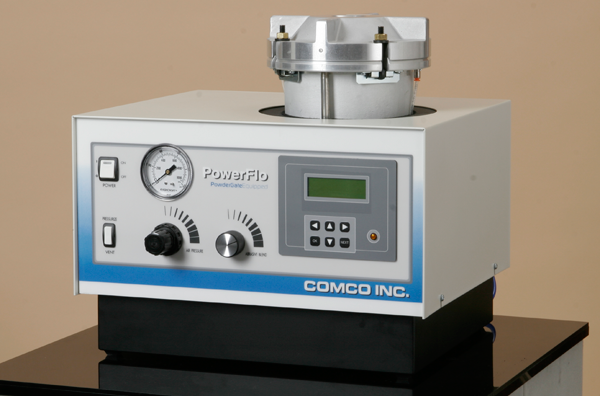 The PowerFlo blaster is designed specifically for automated applications. It includes a number of sensors to monitor system performance and communicate with a host PLC. 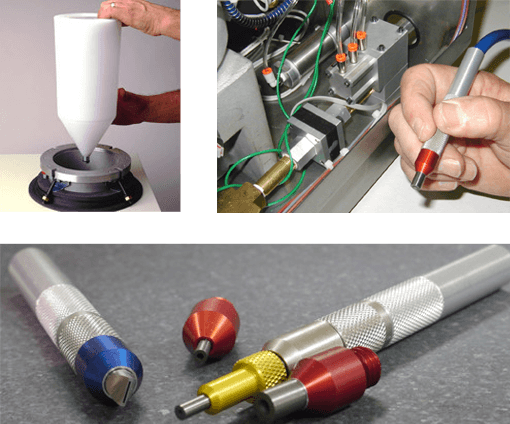 It is commonly integrated into our automation platforms to supply abrasive to multiple nozzles. Communication with the host PLC allows for data tracking and greater control over the blast process. 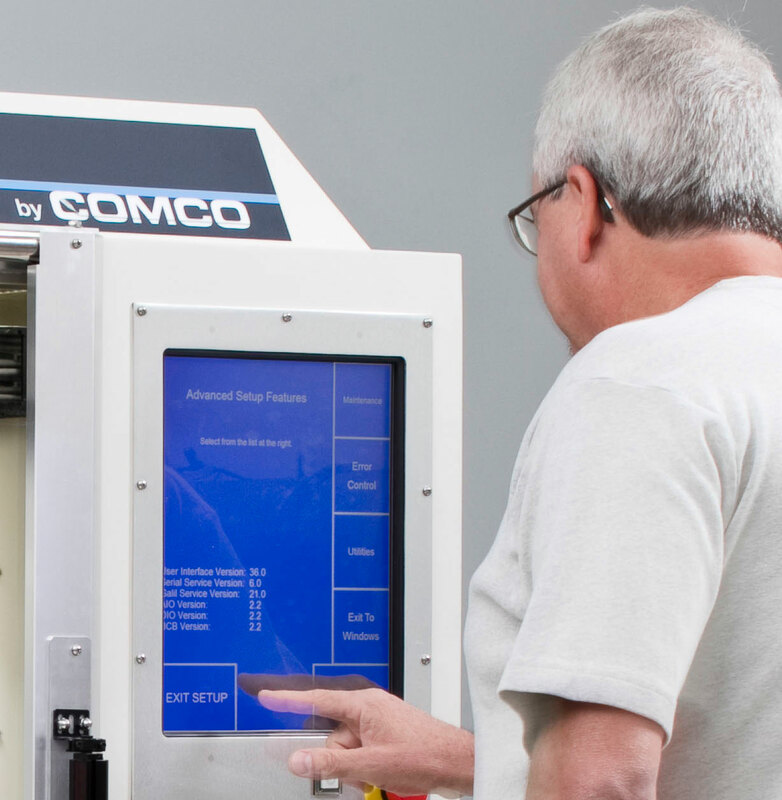 Comco’s DirectFlo provides the same superior performance as the PowerFlo without the integrated electronics for automation. The DirectFlo is ideal for manual applications that require larger nozzles or fixtured applications that require multiple nozzles, such as the Ring Nozzle.